For most Russians, transitioning into new democracy with its associated freedoms has not been an easy task, and for many particularly members of the older generations, the change was not a welcome one. The failure of communism brought with it freedom that many were not prepared to exercise. Not all have welcomed the substantial restructuring of the social order that followed the implosion of the USSR - for mainly apolitical reasons (worsening of conditions for pensioners, state health care patients, educational institutions, cultural organizations, etc). Because the Russian personality has so many faces, it is difficult to define. Defeated by harsh weather, a tumultuous history and the general malaise that ensued, Russians seem to value the status quo and are reluctant to change. Security, stability, and conservatism were always held in high regard; but at the same time you will see new phenomena such as the absence of concern about the future, free spending and easy and quick adaptation of foreign practices in the younger generations in larger cities. Many foreigners find the Russian people an enigma - surprisingly nostalgic about their past yet cautiously optimistic about the future - patient but curious about the possibilities of freedom. As some things in Russia are almost impossible to explain, there is a very good saying that you will hear over and over again as first response to your questions: "Rossiyu umom ne ponyat" which can be translated as "Russia cannot be understood with your mind" (a quotation from the poet Tyutchev). Russians are strong people, able to endure hardship and extreme climate with submission and patience. 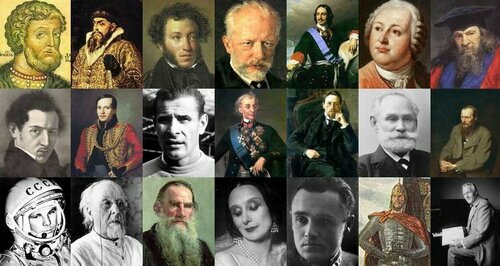 Generally, Russians are very well educated and have a sound knowledge of literature, history and politics. The majority of the country's population lives in European Russia (the part of Russia lying west of the border with Siberia) with the largest population centers being Moscow and St. Petersburg. 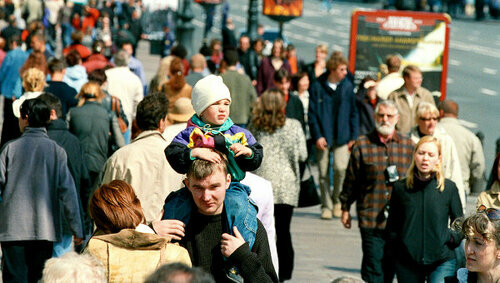 Most families have no more than one or two children, who are the center of the family focus. The Russian people have traditionally been molded and directed from cradle to grave, creating individuals who assumed little responsibility for themselves. They are slowly learning how to take charge of their own lives, but the chasm between the rich and the poor, the healthy and the sick and the skilled and the unskilled continues to widen. Traditional Russian values and core beliefs include: love of children, respect for the old, sense of humour, strong people-orientation, importance of friendship, generosity, pride, patriotism, love of literature and arts, nostalgia, self-sacrifice, apathy, conservatism, aversion to change, caution, collectivism, pessimism and cynicism. There is widely accepted notion in Russia that there is a "soul" that makes Russians different - a sort of sadness born of oppression that demands a different social order. Whether or not this proud melancholia is fact or fiction is arguable, but the belief is almost universally held with great pride. Acres of print have been devoted to the topic, with no very firm conclusions. Russians love and value going to the theatre, opera, ballet and concerts. The arts are avidly devoured by all sections of society - the idea that plays or classical music could be "difficult" or unpopular is rarely encountered. They also enjoy attending readings of literature and poetry. Russians love reading everything from classical literature to translations of contemporary foreign authors. They read on the metro, while they wait, and at home. You will find that your Russian friends can easily recite entire poems or passages from their favourite books. They generally have a very good knowledge of world history, geography and the arts, and this is true regardless of the person's education or occupation. There are some behaviour patterns you may find very different from those you are used to. Some things may shock you initially, but they can usually be explained through Russia's history and your Russian friends will make efforts to help you understand why things are done the way they are. Always remember that what you consider normal behaviour may seem strange to your Russian friends. Two things that newly arrived expatriates often find particularly troubling are the fact that Russians can seem very rude and that they rarely smile in public. Rudeness in public situations is still common. You may encounter it at supermarkets, at the post office, in public transport. Please do not let this discourage you and always remember that this is nothing personal. Smiling at strangers is a rarity in Russia. 70 years of history taught people not to trust anybody and to guard their own territory. Just recall the famous Soviet poster "Ne Boltai" (Do not Chatter) and you will understand the roots of not smiling at unfamiliar persons. There is also an inherited notion from "village Russia" that people who smile for no reason must be simpletons. However, while people tend to be introvert or aggressive on the outside, you will find that they are extremely kind and helpful if you get beyond their first suspicion. Keep going to the same supermarket, the same bank and the same dry cleaners over and over again, keep smiling and do say "hello" and "goodbye" every time you arrive and leave - people will eventually start remembering you and most will start smile back. They are often not used to people being polite and nice to them and your efforts will be appreciated. It may just take some time, so don't give up. Russians seem to have very different concept of what it means to stand in a line. They tend to be pushy while getting on public transport and in the metro you will find that people try to get on while others are still trying to get off. The same applies to lines at meat and cheese counters in supermarkets, where it can be difficult to figure out where the line starts and who is there first. When you go to pay utility bills at a Russian bank, you may find that when it is almost your turn one or two people show up who had "reserved" a place in the line and then took care of something else at another counter or just sit down while waiting for their turn. It is common practice to reserve a place in a line simply by telling the person in front of you "you are behind them" ("ya budu za vami"). This practice dated back to Soviet times when lines for just about everything were so long that it was impossible to get something done if you just occupied one single line. Houses entrances, rest rooms and some other public areas may not be well cared for. You may, for example, see a beautiful apartment in a building with a dilapidated entrance and filthy staircase. In Soviet times, this was not the case: the streets and public areas were clean and littering was basically unheard of. Today people do not seem to care for anything that happens outside of the limits of their apartments. However, things are slowly starting to improve. Drivers in Moscow are generally very aggressive, and you may find this pretty daunting if you come from a country where drivers are polite and abide by the rules. There seems a comprehensive spirit involved in driving - everybody wants to be the first one to take off from a red light. Russians love to comment and give advice. Don't be surprised to get unsolicited advice on how to dress your children in winter or on the necessity of wearing a hat in cold winter. People - both men and women - still drink beer in pubic. While this is not publicly frowned upon, the government is trying to change this habit, but so far the efforts have not led to any noticeable results. Restriction of shopping hours for alcohol was never previously known in Russia, but sterner measures have been introduced from 2009 onwards, mostly by individual cities - the results vary from strict (St. Petersburg, 23:00 total ban) via haphazard (Moscow region) to utterly invisible (most of the rest of the country). While Russians devote considerable time and cost to their own personal wardrobe and grooming, they are relatively unjudgemental about others - figuring that a person' soul is the most important, and taking a very liberal line on allowing for differing customs elsewhere. An odd Soviet throwback, however, is a private habit of awarding unmentioned merit-marks to the quality and shine of the shoes other people wear. You can make a good first impression with very little effort in this field. Sports footwear is poorly regarded in general, and is often cited (by doormen) as fair reason to deny entrance to fashionable clubs or restaurants. While Russians can be secretive when dealing with foreigners, they can also be very curious. You may find yourself in situations when people just met ask you how much money you make. In the vast majority of cases there is absolutely no criminal interest behind these questions, but you may still not want to divulge too much personal information about your family and yourself unless you know your conversation partner very well. Very often such questions arise from "fellow professionals" who are keen to know how their profession might be valued abroad. When you come to a Russian home you will most certainly be offered tea or coffee along with something to eat. If you arrive around lunch and dinner time, you may be invited to join the family for the meal. When inviting Russian friends over your house for drinks make sure you have some good food to offer - drinks accompanied by cheese and grapes just don't do. On the one hand, Russians live in the world's largest country and think big in many ways. They tend to make big plans, even if they know that they will never be able to implement them. At the same time, they usually stand very close to each other in conversation or when standing in line. This may be a remnant from the Soviet past when people had to be very careful about what they said and always made sure that no one else was listening. Standing close to each other allows you to speak more quietly and to feel that others aren't able to hear what you are talking about. When someone has something very important to tell you and you are speaking to that person over the phone, you may still hear them say that "this is not a phone conversation", meaning that they prefer to tell you in person because they are still afraid of someone else may be listening. The reason why people stand close to each other in lines is more difficult to explain. It might have something to do with a feeling of getting to the front of the line sooner as there is less distance to the "target". Touching, hugging, and kissing friends and close acquaintance is common. You may find this uncomfortable if you come from a no- or little- contact culture. As people still pay very little money for electricity and hot water, these resources are literally wasted. Russians will do the dishes under running hot water instead of letting them soak in the sink. Nobody will complain if you take a hot shower for half an hour or a hot bath twice a day. At the same time that electricity is still very cheap, Russians seem to prefer dim lighting. You will notice this in the metro, on the streets, in staircase, and even in people's homes where the lighting could often be a lot brighter. Street lights are not very bright, and often entire yards have no lighting for weeks on end. These days light bulbs in public areas of apartment buildings usually have to be replaced by residents, who are often hesitant about replacing something that is not for their own use exclusively. If you want the housing department or your neighbours to replace the broken light bulbs, you may be in for a very long (and dark) wait. If you encounter such a problem in your apartment building, just buy some light bulbs and replace the broken ones - Russia has no laws (yet) on expensive energy-saving bulbs, and regular clear-glass bulbs cost just pennies. You may win the friendship or respect of your neighbours if you occasionally mop the landing area between the lift and your door.